Nothing says a 'Merry Christmas' more than a handcrafted card. I feel like when I mention anything to do with cards or a similar topic, I end up being really cheesy and stereotypical, but I can't help it - handmade cards/notes/letters just warm my heart. You have been warned. Just like with cupcakes, every year I like to make a new stash of cards. Last year I made these adorable hand embroidery cards which were made with felt shapes, hand stitching, and embellishments. For this time around, I wanted to do something much simpler, using mainly paper crafts, and that can be done by anybody. Even if you think that you don't have a crafting bone in your body - the only thing you need to know how to do is cut and stick papers together. It's very, very simple, but don't they just look great. In case you wouldn't have guessed, I love craft stores. I can spend hours just looking at everything and letting my creativity run wild; which is how these cards came about. 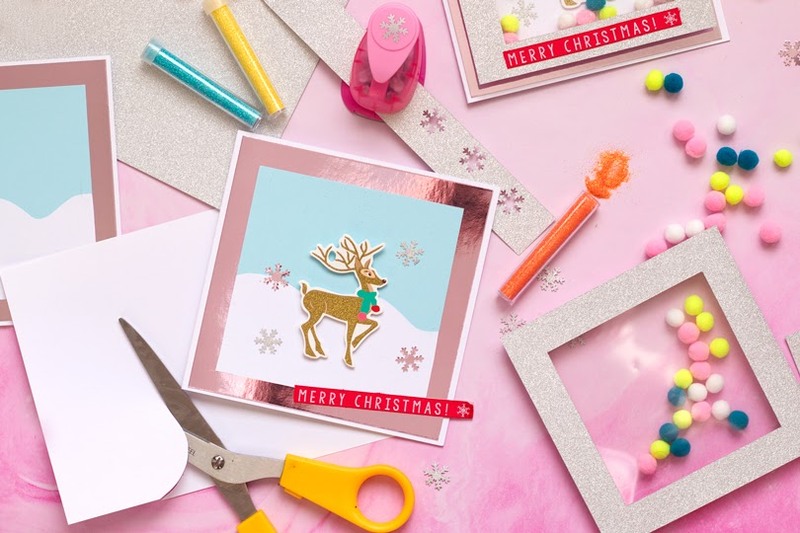 The availability of crafting materials for card making just makes things so easy; from card toppers to textured cardstock, to shaped craft punches. You can even go as far as getting everything you need in a nicely compiled pack. You have no excuses. 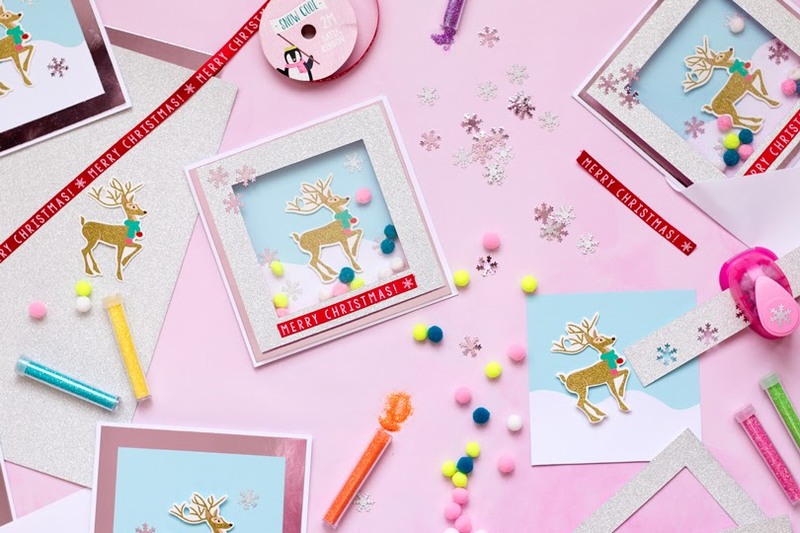 My reindeer pom-pom shaker cards bring a little glitter and sparkle to the festivities - like we need any more. (Oh yes, we do). Shaking the card will fill your winter scene with mini pom-poms and glitter. 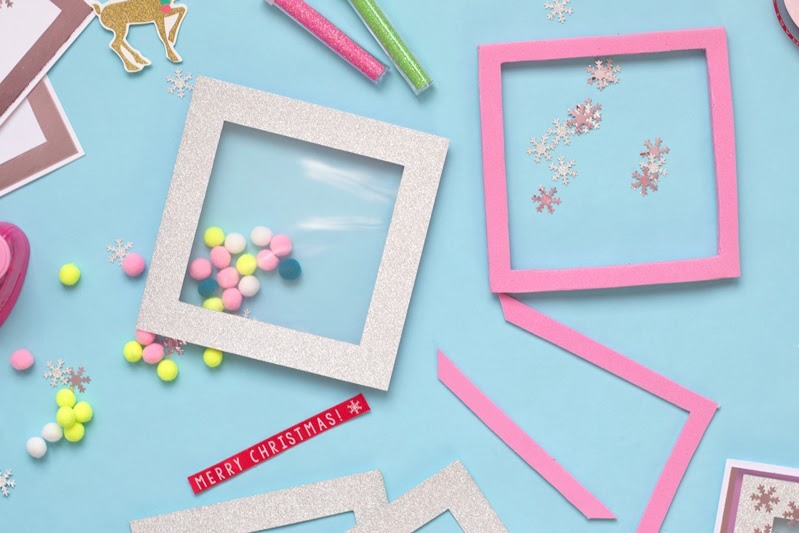 All you have to do is create a paper and foam frame, cut your wintery background, and fill your window then decorate. Don't worry, there is a full guide below explaining it in much better detail. 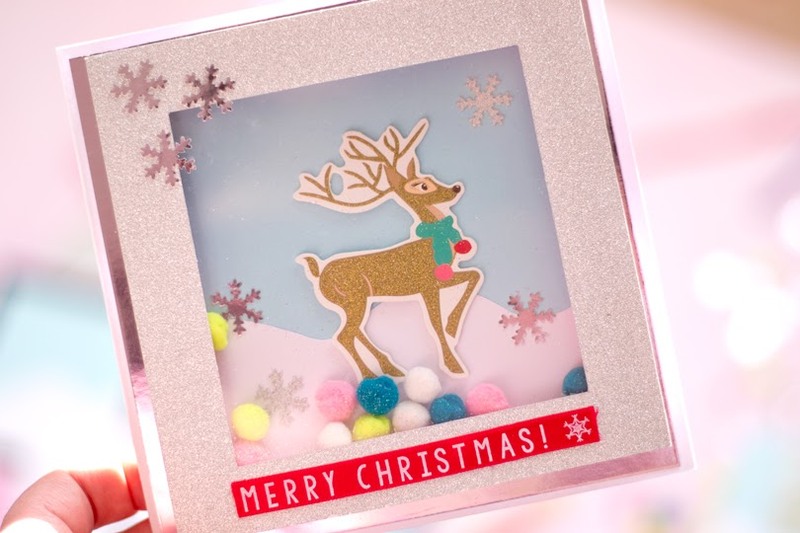 I used a reindeer card topper which honestly makes your card look professional, and like you've spent endless hours putting them together. You can choose any topper you like, animals, letters, or Christmas symbols, you could even make your own. Card toppers are my new favourite thing. I haven't mentioned this on my blog just yet, but I recently purchased a Cricut Maker. Let's just say, paper crafts may be on its way, along with lots more fun things. 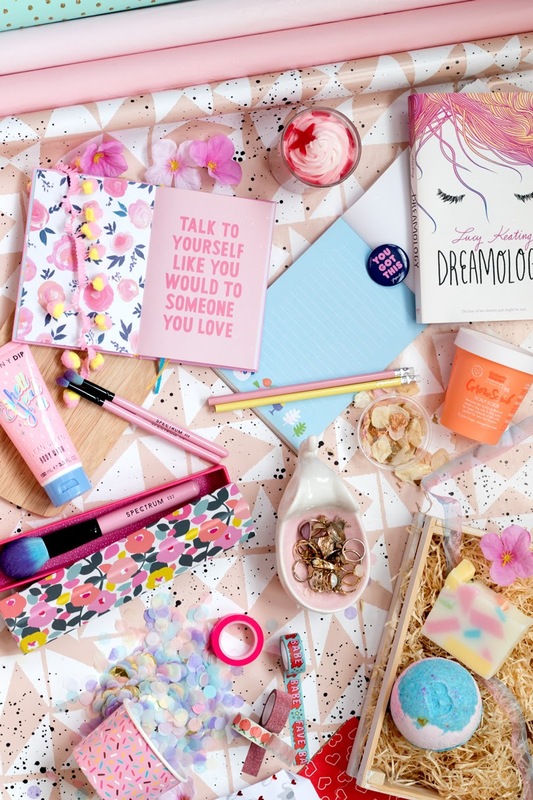 I have been too focused on blogmas to even think about anything more, but if you've loved my blogmas so far, you're going to be obsessed with what I have to come. Exciting times! I shared a post earlier this year about why we should be sending snail mail as a way of showing our appreciation. I have had so much support from bloggers and friends over the past year; it honestly just warms my heart knowing that there are people out there who read and love my content. As a thank you, I will be sending these handmade cards to a few people, which I hope they will love and cherish. So, if I've asked you for your address recently, now you know why. 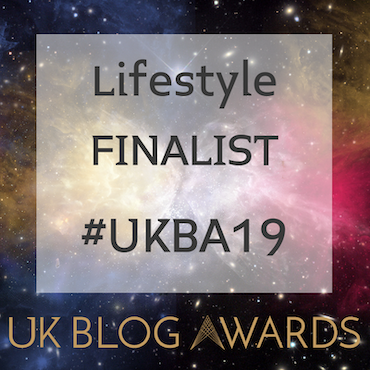 I'm even sending one as far as Australia to one of my favourite bloggers Indya (hopefully it will get there before Christmas!) I also have a post with Christmas inspired snail mail ideas coming up in a couple of weeks - lots of paper craft ideas to share even more love. I find card making so therapeutic. There is something so special about making a handmade card, just to let someone know you have thought about them this Christmas. Even with the simplest of messages, a handmade card can say so much. Okay, okay, that's the last bit of sentimental soppiness. 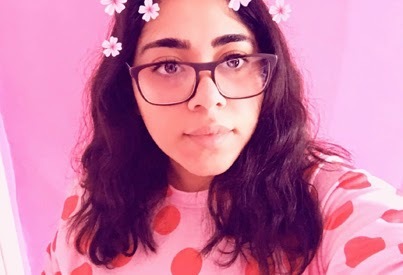 (Well, only in this post. I could never stop being a cheeseball). Cut a square from your foil card that is 1cm smaller than your blank card - my 15cm by 15cm card has a 14cm by 14cm square. Glue this to the centre of your card. 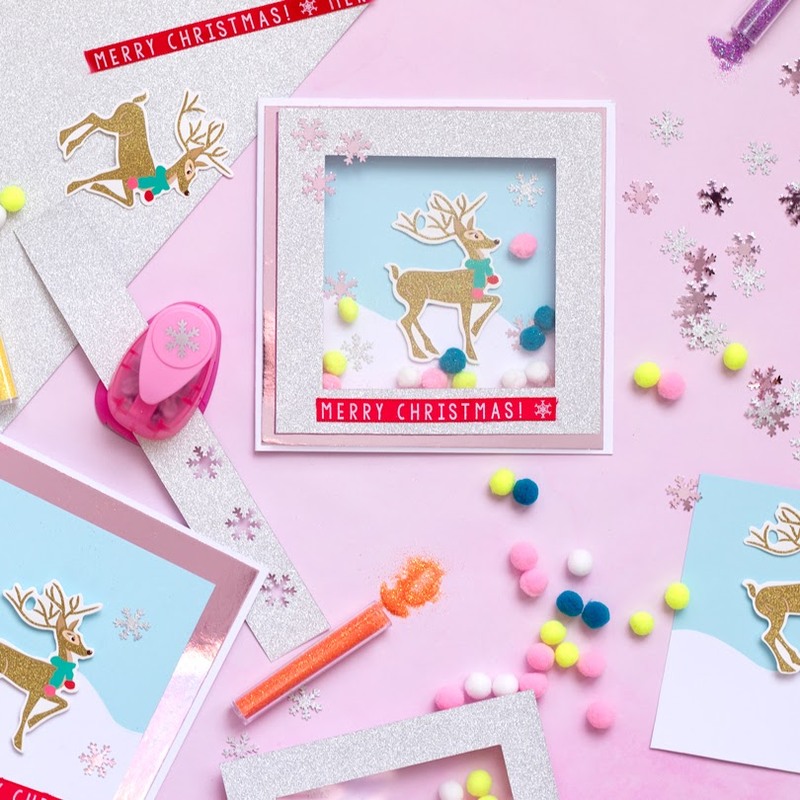 From your glitter card, cut a square that is 1.5cm smaller than your blank card, and create the frame that is about 2cm wide all the way around. 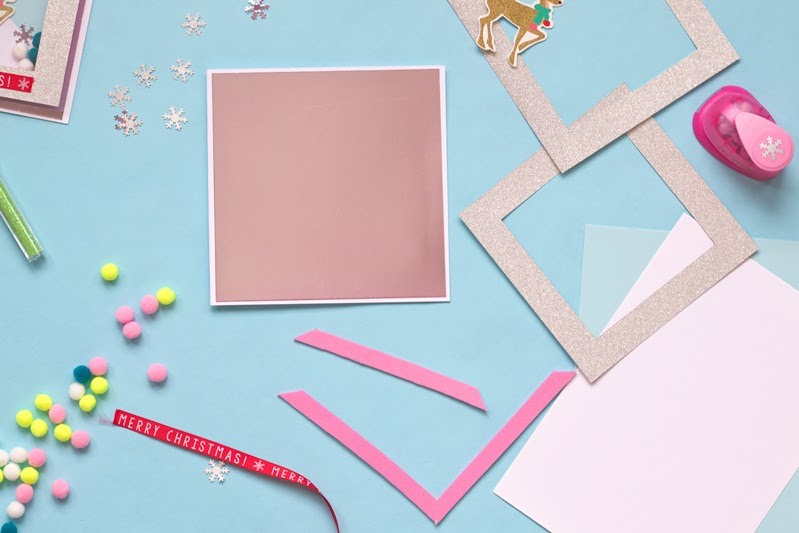 Create your winter background by cutting a blue square (make this about 2cm smaller than your glitter frame), and large waves out of the white card and stick these together to make your snowy mountains. Glue this to the centre of the foil card, and decorate with your card topper and snowflakes. 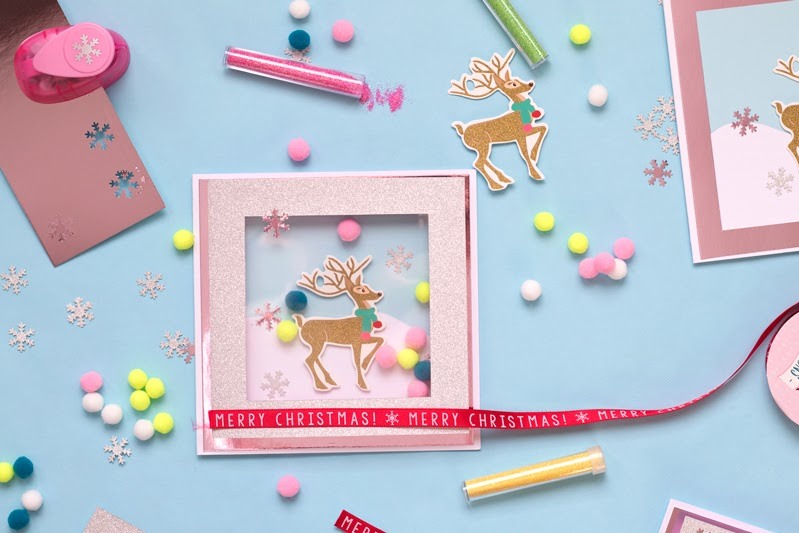 Cut your acetate sheet that is slightly smaller than your glitter frame and stick these together using double-sided tape. To make your frame, cut your foam that will fit around the centre of your glitter frame. Make this about 1cm wide. You can either do this as one continuous frame or cut them into strips. I did a variety of the two to use up all of my foam sheets. You will need to layer your foam frames so your pom-poms will shake around your card - I needed four layers of foam. Attach the layers together with double-sided tape and tape to the back of your glitter frame. 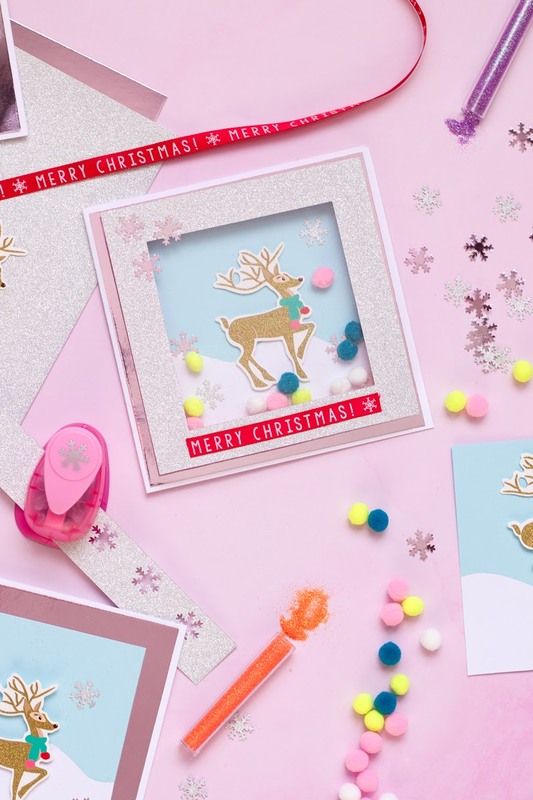 Fill your frame with pom-poms and glitter and stick to the centre of your card with double-sided tape. 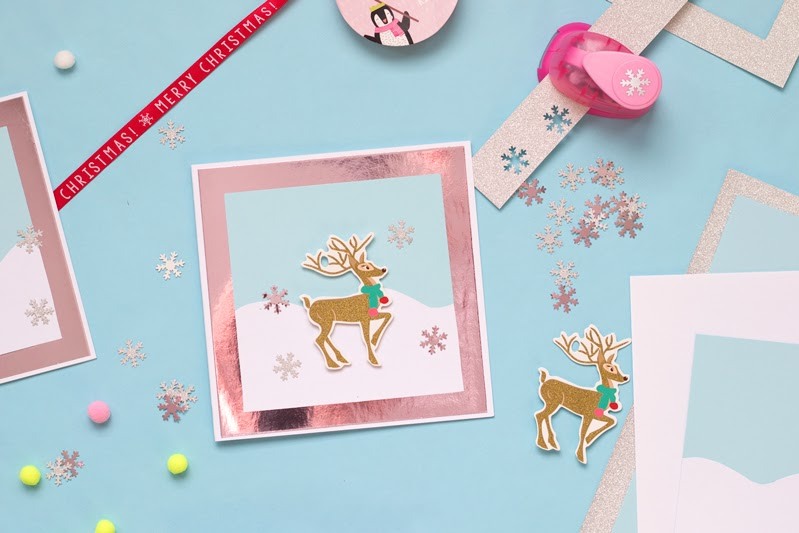 Decorate your cards with 'Merry Christmas' tape, and snow flakes. Let me know in the comments below if you make or buy your cards. If you decide to make these cards or any of my crafts during blogmas, please share your creations. Have you checked out my advent calendar? All my posts are available right there.